Rodrigo Toscano’s newest book of poetry is Deck of Deeds (Counterpath Press, 2012). His previous collection, Collapsible Poetics Theater, was a 2007 National Poetry Series Selection. He was the recipient of a 2005 New York State Fellowship in Poetry. His poetry has appeared in numerous anthologies, including Against Expression, Diasporic Avant-Gardes, Poetic Voices Without Borders, and Best American Poetry. His plays have been performed at the Roy and Edna Disney/CalArts Theater (REDCAT) and Ontological-Hysteric Poet’s Theater Festival. His radio pieces have aired on WPIX FM, KAOS Public Radio, WNYU, and P.S.1 Radio. His poetry has been translated into French, Dutch, Italian, German, Portuguese, Norwegian, and Catalan. Toscano works for the Labor Institute in conjunction with the United Steelworkers and the National Institute for Environmental Health Science. He works out of a laptop, tethered to a Droid, residing in airports, occupying poetics in midflight. CPT: http://poeticstheater.typepad.com/photos/rt_pics/. 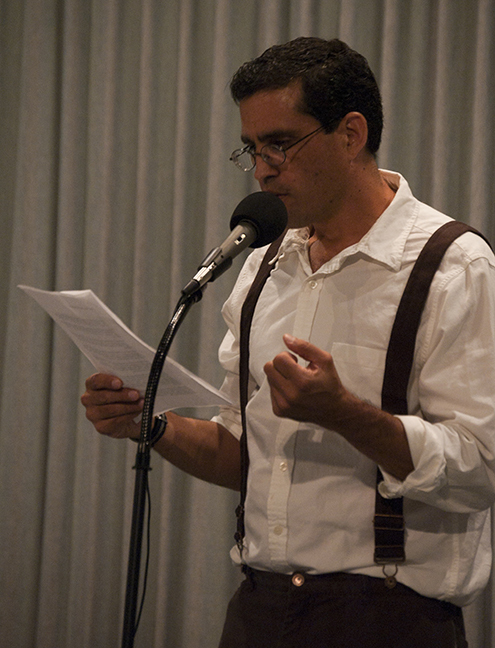 Rodrigo Toscano is a contributor to Nerve Lantern issue 7.